Have I told you that I am so proud of myself that I did not buy any clothes last month. Such a great achievement that I can resist to shop the latest fashion trend last month. Trust me, I worked hard to hold myself from picking any cute clothes that I saw last month. That effort makes me digging my closet and try to maximises what I already have. Just like my outfit at this blog post. 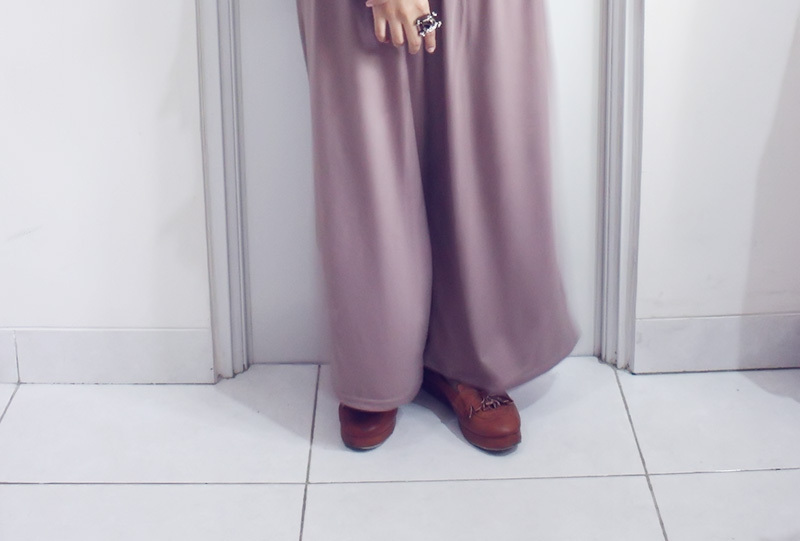 I wore that outfit to meet someone that gonna give a very cool project for my blog. Yeaaay, hope we can make that project soon. By the way you must be getting bored seeing my bag, I wear that bag almost everyday. What can I say, so far that is my all time favourite bag, it has every criteria that I need from a bag in it. It is huge, have no brand on it, strong, brown colour, synthetic breathable leather, has so many hidden pockets, and looks so good. Oh what a bag! I love your outfit & your bag :D Perfect combination yulia! A wonderful bag indeed. But obviously it is very, very heavy :). Beautiful blog. Love your style so interesting! You look really cute and congrats on not shopping!